Ever wondered how efficient your home is? IT MAKES A DIFFERENCE NOT ONLY TO YOUR COMFORT, BUT ALSO THE RUNNING COSTS AND VALUE OF YOUR HOME. Just like a new fridge or a TV with a star rating indicating energy efficiency, you're home can also be assessed for it's thermal performance. The more efficient your home is, the lower the energy costs, the lower the carbon footprint and more sustainable your home becomes. This mean more money to spend on the more important things in life instead of handing it over to Synergy, Alinta, Kleenheat etc with their every-increasing charges. Not only do you save dollars, but your house becoming more energy efficient can increase the value of your home! The Nationwide House Energy Rating Scheme, better known as NatHERS, is a government initiative adopted nationally and by the individual states to standardise the performance of your home. A star rating (out of 10) rates the energy efficiency of your home. The NatHERS assessment takes into account the orientation, design and materials used in construction to rate your home. Using the latest thermal imaging technology, we can assess your home for thermal penetrations and deficiencies that won't be discovered using a NatHERS assessment. 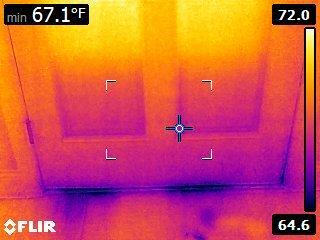 Up to 20% of your total heat loss and gain from your home is through leaks and insufficient workmanship. This can be anywhere from seals, vents and lighting, through to inadequate insulation and materials used. The thermal camera imagery finds problems that are not visible by the naked eye. Every part of the internal and external home is checked, looking for temperature variations indicated by colour variations in the image displayed. For example, the images displayed show missing wall and ceiling insulation, heat loss through down lights as well as a draft coming under the door. 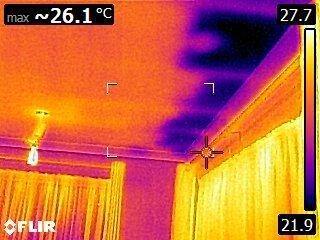 Want to find out more about our thermal assessments or book an assessment?